Remember my earlier post about growing a lush green lawn and another about ornamental grasses to try in your garden? 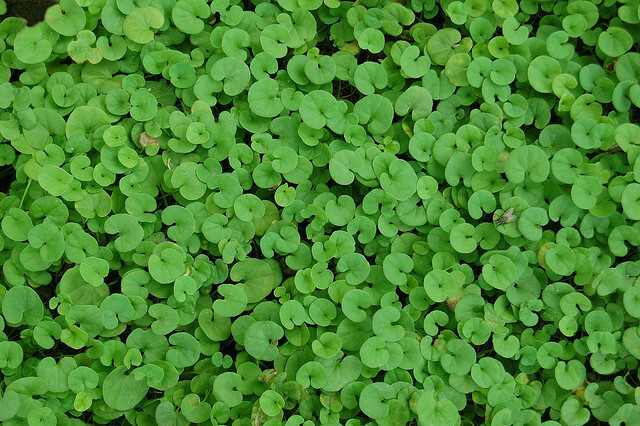 Today, I am introducing quite an unusual plant that you can use as alternative of common grasses for an evergreen and lush lawn – it is Dichondra repens. Dichonrda repens is a low growing, and evergreen herbaceous plant that servers very well as all-seasons ground cover. It grows quite rapidly in warmer climates and covers empty spaces very well. In fact, it forms a thick and tight carpet of small and round leaves. Leaves are of the shape of kidney, that is why the plant is usually known as Kidneyweed. Dichonrda repens is one of the most attractive ground covers that I have seen. It can grow under full or partial sun and requires a well-drained soil. It can be easily mowed and trained to desired size and shape. Dichonrda repens grows easily from seeds and is maintained with occasionally supply of nitrogenous fertilizer. Flowers (white or yellow) are quite inconspicuous but the plant itself is really lovely especially when grown over a large area.